Yersinia enterocolitica is a Gram-negative bacillus-shaped bacterium, belonging to the family Enterobacteriaceae. It is motile at temperatures of 22–29°C, but becomes nonmotile at normal human body temperature . Y. enterocolitica infection causes the disease yersiniosis, which is an animal-borne disease occurring in humans, as well as in a wide array of animals such as cattle, deer, pigs, and birds. Many of these animals recover from the disease and become carriers; these are potential sources of contagion despite showing no signs of disease. The bacterium infects the host by sticking to its cells using trimeric autotransporter adhesins. 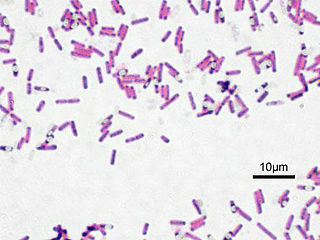 Bacillus is a genus of Gram-positive, rod-shaped bacteria, a member of the phylum Firmicutes, with 266 named species. The term is also used to describe the shape (rod) of certain bacteria; and the plural Bacilli is the name of the class of bacteria to which this genus belongs. Bacillus species can be either obligate aerobes: oxygen dependent; or facultative anaerobes: having the ability to be anaerobic in the absence of oxygen. Cultured Bacillus species test positive for the enzyme catalase if oxygen has been used or is present. The Enterobacteriaceae are a large family of Gram-negative bacteria. This family is the only representative in the order Enterobacteriales of the class Gammaproteobacteria in the phylum Proteobacteria. Motility is the ability of an organism to move independently, using metabolic energy. This is in contrast to mobility, which describes the ability of an object to be moved. Motility is genetically determined, but may be affected by environmental factors. For instance, muscles give animals motility but the consumption of hydrogen cyanide would adversely affect muscle physiology, causing them to stiffen, leading to rigor mortis. In addition to animal locomotion, most animals are motile – the term applies to bacteria and other microorganisms, and to some multicellular organisms, as well as to some mechanisms of fluid flow in multicellular organs and tissue. Motile marine animals are commonly called free-swimming, and motile non-parasitic organisms are called free-living. The genus Yersinia includes 11 species: Y. pestis, Y. pseudotuberculosis, Y. enterocolitica, Y. frederiksenii,Y. intermedia, Y. kristensenii, Y. bercovieri,Y. mollaretii, Y. rohdei, Y. aldovae, and Y. ruckeri. Among them, only Y. pestis, Y. pseudotuberculosis, and certain strains of Y. enterocolitica are of pathogenic importance for humans and certain warm-blooded animals, whereas the other species are of environmental origin and may, at best, act as opportunists. However, Yersinia strains can be isolated from clinical materials, so they have to be identified at the species level. Y. enterocolitica is a heterogeneous group of strains, which are traditionally classified by biotyping into six biogroups on the basis of phenotypic characteristics, and by serotyping into more than 57 O serogroups, on the basis of their O (lipopolysaccharide or LPS) surface antigen. Five of the six biogroups (1B and 2–5) are regarded as pathogens. However, only a few of these serogroups have been associated with disease in either humans or animals. Strains that belong to serogroups O:3 (biogroup 4), O:5,27 (biogroups 2 and 3), O:8 (biogroup 1B), and O:9 (biogroup 2) are most frequently isolated worldwide from human samples. However, the most important Y. enterocolitica serogroup in many European countries is serogroup O:3 followed by O:9, whereas the serogroup O:8 is mainly detected in the United States. Enteritis is inflammation of the small intestine. It is most commonly caused by food or drink contaminated with pathogenic microbes, such as serratia, but may have other causes such as NSAIDs, cocaine, radiation therapy as well as autoimmune conditions like Crohn's disease and coeliac disease. Symptoms include abdominal pain, cramping, diarrhoea, dehydration, and fever. The portal of entry is the gastrointestinal tract. The organism is acquired usually by insufficiently cooked pork or contaminated water, meat, or milk. Acute Y. enterocolitica infections usually lead to mild self-limiting entero colitis or terminal ileitis and adenitis in humans. Symptoms may include watery or bloody diarrhea and fever, resembling appendicitis or salmonellosis or shigellosis. After oral uptake, Yersinia species replicate in the terminal ileum and invade Peyer's patches. From here they can disseminate further to mesenteric lymph nodes causing lymphadenopathy. This condition can be confused with appendicitis, so is called pseudoappendicitis. In immunosuppressed individuals, they can disseminate from the gut to the liver and spleen and form abscesses. Because Yersinia species are siderophilic (iron-loving) bacteria, people with hereditary hemochromatosis (a disease resulting in high body iron levels) are more susceptible to infection with Yersinia (and other siderophilic bacteria). In fact, the most common contaminant of stored blood is Y. enterocolitica. See yersiniosis for further details. Ileitis is an inflammation of the ileum, a portion of the small intestine. Crohn's ileitis is a type of Crohn's disease affecting the ileum. Ileitis is caused by the bacterium Lawsonia intracellularis. Inflammatory bowel disease does not associate with Lawsonia intracellularis infection. In biology, a self-limiting organism or colony of organisms limits its own growth by its actions. For example, a single organism may have a maximum size determined by genetics, or a colony of organisms may release waste which is ultimately toxic to the colony once it exceeds a certain population. In some cases, the self-limiting nature of a colony may be advantageous to the continued survival of the colony, such as in the case of parasites. If their numbers became too high, they would kill the host, and thus themselves. In other cases, self-limitation restricts the viability of predators, thus ensuring the long-term survival of rare species. Erythema nodosum (EN), also known as subacute migratory panniculitis of Vilanova and Piñol, is an inflammatory condition characterized by inflammation of the fat cells under the skin, resulting in tender red nodules or lumps that are usually seen on both shins. It can be caused by a variety of conditions, and typically resolves spontaneously within 30 days. It is common in young people between 12–20 years of age. Reactive arthritis, formerly known as Reiter's syndrome, is a form of inflammatory arthritis that develops in response to an infection in another part of the body (cross-reactivity). Coming into contact with bacteria and developing an infection can trigger the disease. By the time the patient presents with symptoms, often the "trigger" infection has been cured or is in remission in chronic cases, thus making determination of the initial cause difficult. Yersinia is a genus of bacteria in the family Yersiniaceae. Yersinia species are Gram-negative, coccobacilli bacteria, a few micrometers long and fractions of a micrometer in diameter, and are facultative anaerobes. 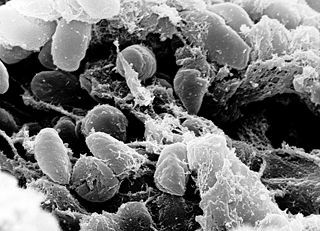 Some members of Yersinia are pathogenic in humans; in particular, Y. pestis is the causative agent of the plague. Rodents are the natural reservoirs of Yersinia; less frequently, other mammals serve as the host. Infection may occur either through blood or in an alimentary fashion, occasionally via consumption of food products contaminated with infected urine or feces. 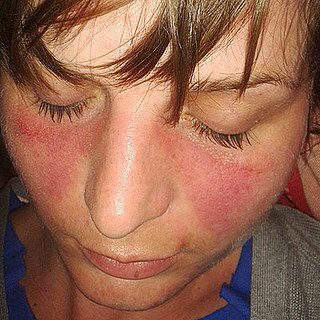 Sjögren syndrome is a long-term autoimmune disease that affects the body's moisture-producing glands. Primary symptoms are a dry mouth and dry eyes. Other symptoms can include dry skin, vaginal dryness, a chronic cough, numbness in the arms and legs, feeling tired, muscle and joint pains, and thyroid problems. Those affected are at an increased risk (5%) of lymphoma. Autoimmunity is the system of immune responses of an organism against its own healthy cells and tissues. Any disease that results from such an aberrant immune response is termed an "autoimmune disease". Prominent examples include celiac disease, diabetes mellitus type 1, sarcoidosis, systemic lupus erythematosus (SLE), Sjögren's syndrome, eosinophilic granulomatosis with polyangiitis, Hashimoto's thyroiditis, Graves' disease, idiopathic thrombocytopenic purpura, Addison's disease, rheumatoid arthritis (RA), ankylosing spondylitis, polymyositis (PM), dermatomyositis (DM) and multiple sclerosis (MS). Autoimmune diseases are very often treated with steroids. Yersiniosis is an infectious disease caused by a bacterium of the genus Yersinia. In the United States, most yersiniosis infections among humans are caused by Yersinia enterocolitica. Yersinia pseudotuberculosis is a Gram-negative bacterium that causes Far East scarlet-like fever in humans, who occasionally get infected zoonotically, most often through the food-borne route. Animals are also infected by Y. pseudotuberculosis. The bacterium is urease positive. Intimin is a virulence factor (adhesin) of EPEC and EHEC E. coli strains. It is an attaching and effacing (A/E) protein, which with other virulence factors is necessary and responsible for enteropathogenic and enterohaemorrhagic diarrhoea. HLA-DR4 (DR4) is an HLA-DR serotype that recognizes the DRB1*04 gene products. The DR4 serogroup is large and has a number of moderate frequency alleles spread over large regions of the world. Fc receptor-like protein 3 is a protein that in humans is encoded by the FCRL3 gene. An autoimmune disease is a condition arising from an abnormal immune response to a normal body part. There are at least 80 types of autoimmune diseases. Nearly any body part can be involved. Common symptoms include low grade fever and feeling tired. Often symptoms come and go. Yersiniabactin (Ybt) is a siderophore found in the pathogenic bacteria Yersinia pestis, Yersinia pseudotuberculosis, and Yersinia enterocolitica, as well as several strains of enterobacteria including enteropathogenic Escherichia coli. Siderophores, compounds of low molecular mass with high affinities for ferric iron, are important virulence factors in pathogenic bacteria. Iron—an essential element for life used for such cellular processes as respiration and DNA replication—is extensively chelated by host proteins like lactoferrin and ferritin; thus, the pathogen produces molecules with an even higher affinity for Fe3+ than these proteins in order to acquire sufficient iron for growth. As a part of such an iron-uptake system, yersiniabactin plays an important role in pathogenicity of Y. pestis, Y. pseudotuberculosis, and Y. entercolitica. Proteus penneri is a Gram-negative, facultatively anaerobic, rod-shaped bacterium. It is an invasive pathogen and a cause of nosocomial infections of the urinary tract or open wounds. Pathogens have been isolated mainly from the urine of patients with abnormalities in the urinary tract, and from stool. P. penneri strains are naturally resistant to numerous antibiotics, including penicillin G, amoxicillin, cephalosporins, oxacillin, and most macrolides, but are naturally sensitive to aminoglycosides, carbapenems, aztreonam, quinolones, sulphamethoxazole, and co-trimoxazole. Isolates of P. penneri have been found to be multiple drug-resistant (MDR) with resistance to six to eight drugs. β-lactamase production has also been identified in some isolates. Far East scarlet-like fever or scarlatinoid fever is an infectious disease caused by the gram negative bacillus Yersinia pseudotuberculosis. In Japan it is called Izumi fever. Yersinia frederiksenii is a Gram-negative species of bacteria. It uses rhamnose and sucrose. Its type strain is strain 6175. In humans, it can cause gastrointestinal infections, while it has also been found in fish. Yersinia kristensenii is a species of bacteria. It is Gram-negative and its type strain is 105. It is potentially infectious to mice. It secretes a bacteriocin that targets related species. Yersinia intermedia is a Gram-negative species of bacteria which uses rhamnose, melibiose, and raffinose. Its type strain is strain 3953. It has been found in fish, and contains several biotypes. It is not considered of clinical relevance, being isolated from humans in a routine manner. Yersinia mollaretii is a Gram-negative species of bacteria. Yersinia bercovieri is a Gram-negative species of enteric bacteria. ↑ Kapatral, V.; Olson, J. W.; Pepe, J. C.; Miller, V. L.; Minnich, S. A. (1996-03-01). "Temperature-dependent regulation of Yersinia enterocolitica Class III flagellar genes". Molecular Microbiology. 19 (5): 1061–1071. doi:10.1046/j.1365-2958.1996.452978.x. ISSN 0950-382X. PMID 8830263. ↑ "Yersinia spp. | MicrobLog: Microbiology Training Log". microblog.me.uk. Retrieved 2016-02-10. ↑ Collins FM (1996). "Pasteurella, and Francisella". In Barron S; et al. Barron's Medical Microbiology (4th ed.). University of Texas. ISBN 978-0-9631172-1-2. NBK7798. ↑ Fàbrega A, Vila J (2012). "Yersinia enterocolitica: pathogenesis, virulence and antimicrobial resistance". Enferm. Infecc. Microbiol. Clin. 30 (1): 24–32. doi:10.1016/j.eimc.2011.07.017. PMID 22019131. ↑ Goljan, Edward F. Rapid Review Pathology. Second Edition. Page 279, Table 15-1. ↑ Bottone, Edward (April 1997). "Yersinia enterocolitica: the charisma continues". Clinical Microbiology Reviews. 10 (2): 257–276. doi:10.1128/CMR.10.2.257. PMC 172919 . PMID 9105754. ↑ Hill Gaston JS, Lillicrap MS (2003). "Arthritis associated with enteric infection". Best Pract Res Clin Rheumatol. 17 (2): 219–39. doi:10.1016/S1521-6942(02)00104-3. PMID 12787523. ↑ Benvenga S, Santarpia L, Trimarchi F, Guarneri F (2006). "Human Thyroid Autoantigens and Proteins of Yersinia and Borrelia Share Amino Acid Sequence Homology That Includes Binding Motifs to HLA-DR Molecules and T-Cell Receptor". Thyroid. 16 (3): 225–236. doi:10.1089/thy.2006.16.225. PMID 16571084. ↑ Tomer Y, Davies T (1993). "Infection, thyroid disease, and autoimmunity" (PDF). Endocr Rev. 14 (1): 107–20. doi:10.1210/er.14.1.107. PMID 8491150. ↑ Toivanen P, Toivanen A (1994). "Does Yersinia induce autoimmunity?". Int Arch Allergy Immunol. 104 (2): 107–11. doi:10.1159/000236717. PMID 8199453. ↑ Strieder T, Wenzel B, Prummel M, Tijssen J, Wiersinga W (2003). "Increased prevalence of antibodies to enteropathogenic Yersinia enterocolitica virulence proteins in relatives of patients with autoimmune thyroid disease". Clin Exp Immunol. 132 (2): 278–82. doi:10.1046/j.1365-2249.2003.02139.x. PMC 1808711 . PMID 12699417. ↑ Hansen P, Wenzel B, Brix T, Hegedüs L (2006). "Yersinia enterocolitica infection does not confer an increased risk of thyroid antibodies: evidence from a Danish twin study". Clin Exp Immunol. 146 (1): 32–8. doi:10.1111/j.1365-2249.2006.03183.x. PMC 1809723 . PMID 16968395. Scholia has a topic profile for Yersinia enterocolitica. "Yersinia enterocolitica". NCBI Taxonomy Browser. 630.